These coffee-flavored donuts based off Ben & Jerry’s Coffee Caramel Buzz ice cream flavor add a subtle, warm coffee aroma to their tender, moist crumb. The malt powder adds that unique flavor to the coffee which is strikingly similar to the ice cream! And can I just say I’m obsessed with the caramel glaze? Sinfully delicious! 1. Preheat oven to 375 degrees F. Liberally grease a 4-cavity long john donut pan or a 6-cavity regular donut pan; set aside. 2. In a large bowl, sift together the baking soda, baking powder, malt powder, salt and flour. In a medium bowl, combine the butter, brown sugar and honey; beat together with an electric mixer until creamy. Add the egg, yogurt, coffee, and extract and carefully beat to combine. Gradually add the wet mixture to the flour mixture until a dough forms. 3. Pour the batter into a gallon-sized Ziploc baggy; seal out the air. Snip off a corner of the baggy and carefully pipe the batter into the greased donut cavities, about 2/3 full. Bake the donuts for approx. 10 minutes (in the long john pan) and approx. 11-12 minutes (in the regular donut pan). Allow the donuts to cool slightly in the pans, about 5 minutes, before carefully inverting them to a wire rack to cool completely. Bake any additional donut batter, if needed. Once donuts are baked & cooled, prepare your glaze. 1. In a small saucepan, melt the butter, brown sugar and vanilla together, stirring continuously. Bring the mixture to a rapid boil, constantly stirring, for 2-3 minutes or until darker in color. Remove from the heat and stir in the powdered sugar, about 1/2 cup at a time. Add more powdered sugar to thicken the glaze if need be*. The glaze shouldn’t be too runny but shouldn’t be as thick as icing, either. 2. Dip the tops of the donuts into the glaze, allowing excess to drip off. Repeat the dunk process one more time. 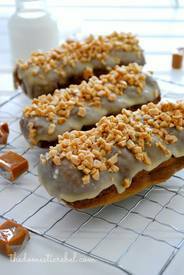 Return the donuts to the wire rack and sprinkle immediately with toffee bits. Allow the glaze to set, about 10-15 minutes, before serving. These make about 6 long john donuts or about 8-10 regular donuts, and can be kept at room temperature for a couple days, stored airtight.